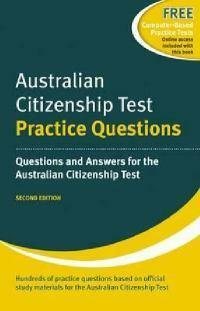 Australian Citizenship Test is the perfect study companion for ensuring you pass your test on your first attempt. This book includes hundreds of practice questions so that you can check that you are ready to take the test. All practice questions are set out in the same format as the official test and have been developed from the official study materials published by the Department of Immigration and Citizenship. Also included with this book is a free subscription to further online computer based tests at the publisher’s website www.AussieTest.com If you need to take the Australian citizenship test then this book is a must-have study companion.